It's MARDI GRAS! You don't have to do anything! And in fact, eating too much sweets is totally encouraged! I get more done in pj's..isn't it great to work from home! I'm so gLad there are others in this worLd like me ♥ I had to (((giggle)))about the 3x reHeated coFFee [I do that all the time]! enJOY the Day~~OK? I'm about to get into mine too. BTW, I just wanted to say thanks you for Bead Soup post card you mailed out to participants - I got mine yesterday, not expecting it, and it gave me a smile. A "One of those days" and jammies days are good to have now and then. I am totally feelin' that today. I'm still in jammies too. With a bird on my shoulder and a cat in my lap. Love it!! The weather is rainy and gloomy here, the perfect day to stay in bed. The only reason I changed out of my jammies is that we need food....and the plumber is coming to fix our garbage disposal (I didn't appreciate how much the thing does for us until it quit working). Hey it's me again! Well i think after reading the comments i declare "International Women's Day"
Some days that is the way it goes. Embrace it!! Responding to this post while I sit in my blue soft robe not wanting to get dressed to pick up the kids. "Is it 3 already?! I need to brush my hair!" Dear Lori, this is hillarious. I'm going to use this on the next pajamas I make. I've already saved the image of the clueless sheep you posted a couple of weeks ago to spiff up a t-shirt. Mmmm . . . a day of PJ's attire is just what the doctor ordered! I went to my mailbox today and when I opened it I began to smile. Thank you for your darling little surprise gift of paying it forward. It's such fun to get a goody in the mail. I've already posted a pay it forward myself and hope to bring a smile to someone's face soon. Your inspiration moves on with me to the next person. I wish I were in mine but our office isn't quite that forward-thinking yet. I totally had one of those days today! But I did get lots done. 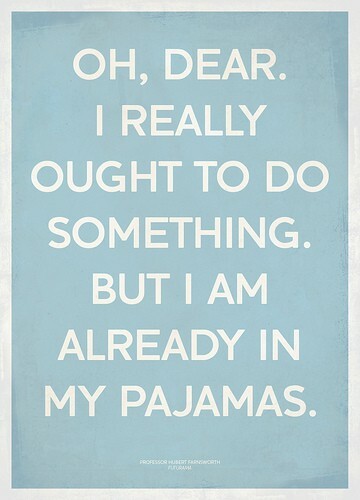 I conclude jamjams (what I call pyjamas) actually help productivity! It seemed like everyone was in such a bad mood today and then I saw your post and Smiled. Thanks. Well, I just got home and my plans are, jammies and a BIG FAT jelly doughnut! Happy Fat Tuesday! Enjoy staying in your jammies!! Won't even take my jammies off all day tomorrow (day off! ), so I can totally relate to your post. Hey, since we are totally gorgeous, amazing and adorable anyway, I can't see how one day of self- indulgence can do any harm. Heck knows we deserve it. You most of all. I know lots of things you can do in your pyjamas. Hope you had a great day! :o) It could mean a nice day of relaxation! I like the idea of you taking a break and being free to enjoy life! OIY! I think I've lived this quote for two days now. I can't get anything done, I swear it's the gray weather. Cat, good book, couch is all I'm capable of. haha! I love this!! am guilty of still being in pj's also. Just wanted to pop in and thank you for the lovely thank you postcard, Lori! So nice of you to take the time to do that, but no thanks needed here. Was absolutely my pleasure to take part! We need days like that. Oh my dear you have NO IDEA! I should have started yesterday all over! I can not believe how UTTERLY wrong it went. I love my pajama days! Amen to that! It's raining in Atlanta - monsoon raining. That kind of day in Houston, too. Got up. Had coffee. Took shower. Put the night clothes back on and took out the beads. Think of all the time I'll save at bedtime tonight! HA! I have waaay to many of those days!